For those of us who generate a lot of PDF documents, especially for quotes and such where the client may not have a product to open our files, the new save as PDF add-on feature for Office 2007 is KEWL! It can be found here: Office 2007 Save as PDF Add-On. Need a PDF generator for your other programs that is free to use? You can find one in the PDFCreator. If you download the MSI file, you can deploy the simple printer driver via Group Policy! That in and of itself makes this little utility very handy, and your users happy as the PDFCreator printer based interface is very easy to use. Let me read about more steps that might be required to solve the problem. The first option, when I ran it a couple of times, once after a reboot did not work. The second option took me to a non-descript search page with no indication as to what I was to search for! You should then receive a message to say it was successful. After running these commands, reboot the system, head back to the Microsoft Update site and you should be good to go. Hats off to Daniel Petri's Forums for this information! As most of us may know, Symantec purchased Veritas software. We have been using the Veritas BackupExec product for our larger SBS production servers for a number of years now. The multiple tape library drive support is good for larger data volumes, backup management is relatively easy to work with, and once installed, BackupExcec runs very stable. I do believe that we all go through some sort of apprehension when a vendor of a product we have been using for a long time gets absorbed in some sort of corporate way by another most of the time larger vendor. It was no different for me when Symantec picked up Veritas. Other than the rebranding "edition" of 10d for BackupExec for Windows Servers, nothing really changed. Well, unfortunately, that initial apprehension was warranted. Recently, Symantec released a new version of BackupExec: 11d. This new version incorporates a bunch of new features, one of the best of which is encryption of all data on the backup tapes. For those with an existing support contract, one has to log in to Symantec's "NEW" licensing portal, register the licenses, and go through a process to obtain the new media for installation via download, and the keys necessary to install the new product. Having multiple clients with support contracts, some of them new so we were going to install the newer version as the initial install, we were into the Portal right away to upgrade their licenses, keys, and obtain the new product via download. But, we could not as none of the client accounts we setup on the new Portal would work as they should. Phone support wait times in the first weeks of the product and Portal release, were indicated at anywhere up to 12 HOURS! Yes, TWELVE hours. We ended up setting up the built in SBS backup to run a backup to a USB hard disk for anyone who had to wait for support. We supplied and installed at least two for each client so that one could be off-site at any given time. After this experience, and given the success of the SBS backups to USB, and our client's willingness to rotate the drives, the simplicity of the setup, we may forgo using Veritas. The one thing that I will need to do, and this is a priority at this point, is to run some recovery scenarios against a couple of our client's backup files (with their permission of course). So, food for thought: Do we continue with Veritas where there is high data volume, or do we rethink things and run with the USB hard drive based backup? What about encyrption for the data on those drives? 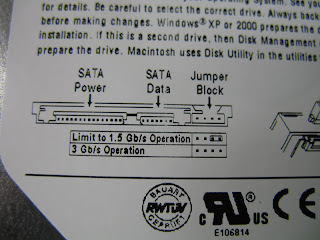 For those of us who build systems, whether occasionally, or all the time, it is important to note that Seagate includes a jumper on their SATA 300 GBs (SATA II) hard drives that limits the drive's performance to 150 GBs. For some older Intel RAID controllers, and others, that are limited to SATA 150, this setting applies. 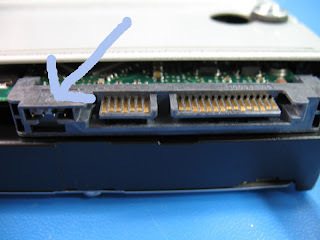 But for newer SATA 300 RAID controllers as well as onboard SATA 300 controllers this jumper should be removed in order to obtain the performance that the hard drive was designed for. My name is Philip, and I am actively involved in our Small Business Specialist Community here in Canada. I hope that I can share some knowledge that I have gleaned over the years, as well as my opinions on virtually anything and everything IT related for the most part! Please feel free to call me on someting if you see that I have made an mistake on something in my writings.